I'm reposting this today to celebrate National Hot Tea Month and the 80th anniversary of Margaret Mitchell's Gone With the Wind. 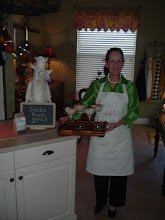 I invited a few of my Southern friends for a Southern Lady Afternoon Tea. 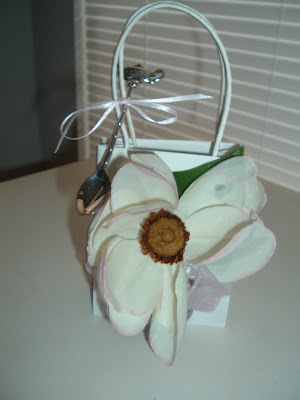 The invitations set the tone for the event, with a Southern magnolia motif on the front and a mint tea sample teabag inserted into the slot of the teacup design. 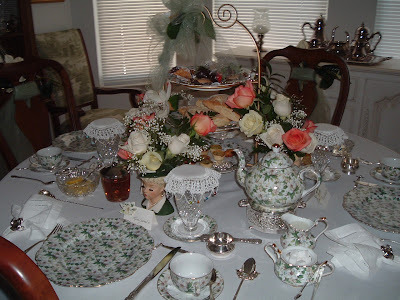 This tablescape was perfect for Afternoon Tea. 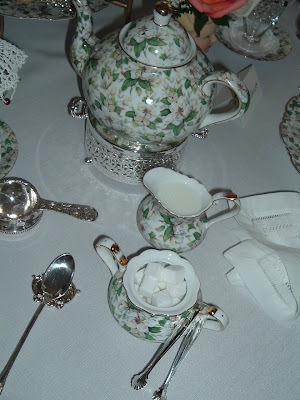 The china pattern has a Southern magnolia motif and all the proper tea accoutrements were displayed. 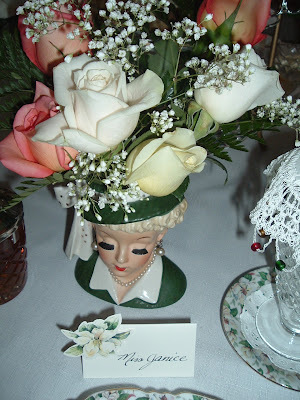 The tiered tea tray made an elegant centerpiece and was surrounded by the very proper young ladies head vases, holding beautiful fresh rose arrangements--very Southern. The soundtrack from Gone with the Wind played softly in the background and added to the ambiance of the event. All of my very favorite Southern friends were invited and as the hostess, I took the worst seat--the one closest to the kitchen. 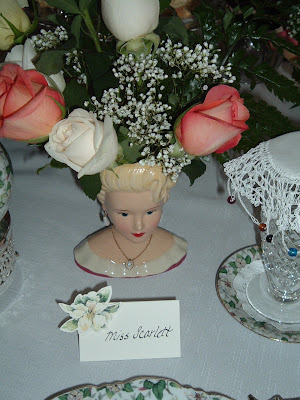 Miss Scarlett was my Guest of Honor and was seated in the best seat, just to my right. Miss Melanie...bless her heart, she's so sweet...was seated to my left, because she was the second-most important guest at the tea. Y'all know Miss Scarlett simply had to be the most important person there or she would have pitched a hissy fit! 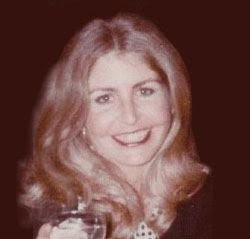 Miss Melanie was ever-so gracious. 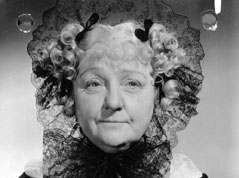 Aunt Pittypat was seated across from me--she would have been miffed if I hadn't invited her and was just ecstatic to be there! Mammy prepared the most delicious afternoon tea foods for us to enjoy. I greeted my guests at the door, at which time they all removed their gloves. After everyone was present, I invited them into the dining room for tea. 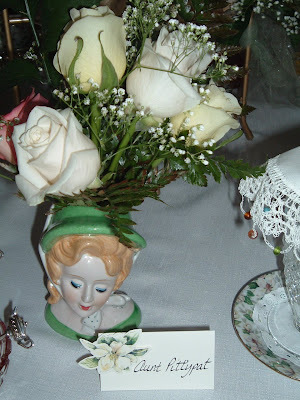 Place cards with a pretty magnolia motif were placed at each setting, directing the ladies to their places--of course they would never dream of switching the cards! 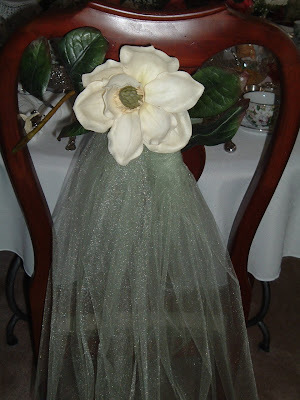 The ladies placed their hands on the back of the chairs (adorned with magnolia blooms and celadon tulle) until everyone was at the table. I took my seat first and then each guest properly entered their chair from the right-hand side of the chair. 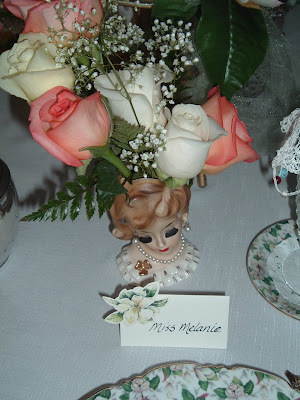 Let's take a look at the place setting. 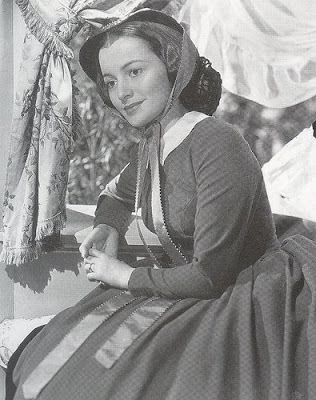 Before anything was touched, Aunt Pittypat said Grace and then I placed my serviette onto my lap, signaling to the guests that they should place their serviette onto their lap and the tea began. 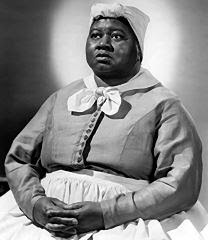 I was "Mother" and poured the Plantation Mint hot tea, because Mammy was so busy in the kitchen. The teapot was resting on top of a teapot warmer. 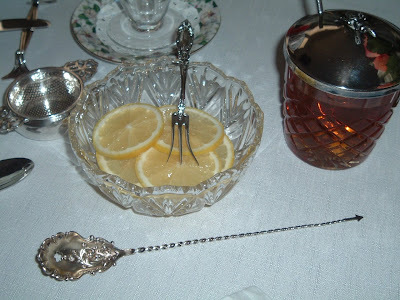 Loose tea was steeped, so the tea strainers were placed at each setting. The sugar cubes, tongs, honey, lemon slices, and milk were also nearby. I poured the tea for each guest and handed the cup and saucer directly to them--I did not pass it around the table. 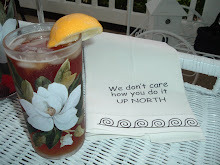 Mammy poured the Georgia Peach iced tea into the goblets at each place setting. 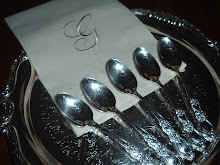 The guests used their iced teaspoons ever-so properly, just like any Southern lady would. 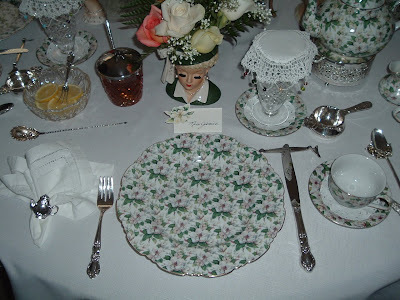 Each guest served themselves the dainty tea foods from the tiered tray, starting at the bottom--eating the savories first, then the scones, and finally the desserts. Oh, what a wonderful time we had, eating the delicious tea foods, sipping the hot tea and iced tea, and making pleasant conversation and telling bits of gossip! I graciously asked each guest if they would "like tea," not "more tea?" 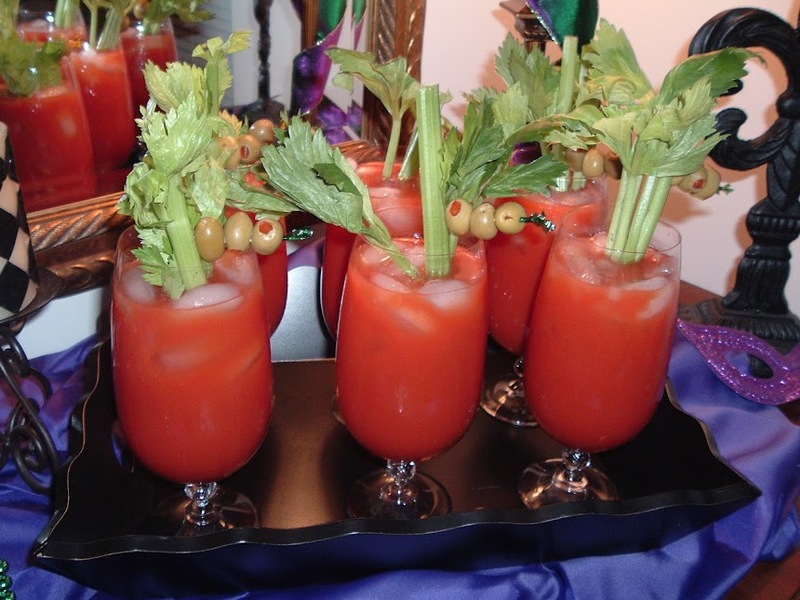 I almost forgot to tell you about something every gracious Southern hostess does--I gave each guest a party favor--to thank them for coming! 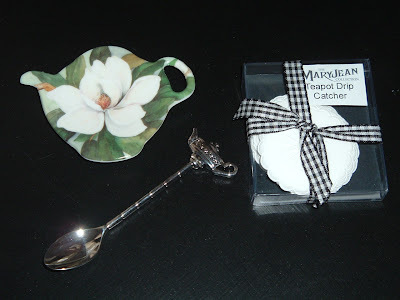 Inside each petite gift bag was a magnolia-motif teabag holder, a packet of teapot drip catchers, and a silver teapot motif teaspoon. After a Very Southern...Very Memorable time, I placed my serviette back on the table to the left of my plate, signaling that the tea was over. All the guests exited their chairs from the right-hand side and said their thank yous. I accompanied them to the front door and said goodbye. 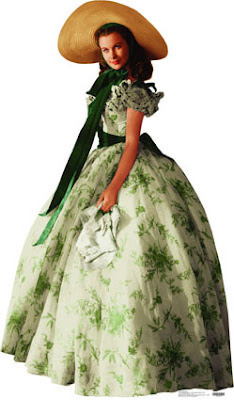 Now, being the proper Southern ladies that they are, their thank-you notes were probably addressed to me before the tea--and definitely in the mail to me the next morning! What makes a 'Girl Raised in the South' so very extraordinary? Why it's the very essence of who we are--our style, our heritage, and our upbringing. 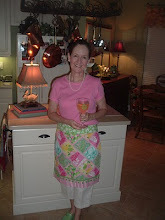 ~Deborah Ford, author "Girls Raised in the South Guide to Life"
Are you a Southern Lady? 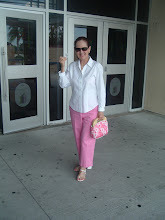 Take Miss Janice's test here. Thank you visiting with me today. I hope that you had an enjoyable visit. National Hot Tea month is drawing to a close. 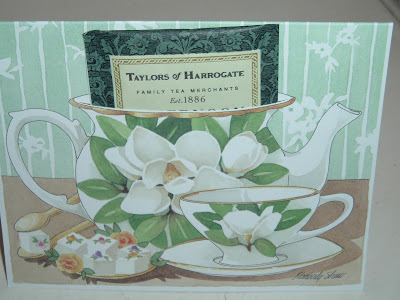 My next and final post of the month will feature: tea-related websites, books and magazines about tea, and information regarding programs available for those who might be interested in teaching tea and etiquette.